François Coty unassumingly made history when created his 1917 perfume -‘Chypre’ (literally translated as ‘Cyprus’). Little did he know then that with this one perfume he was responsible for one of the most highly revered styles of perfume to have ever graced the noses of the perfume loving world. With Chypre he sparked the imaginations of his peers and paved the way for an entirely new style of perfume – a style that has evolved significantly over the years. Using a signature accord of bergamot, patchouli, oak moss and labdanum, few genres of perfume are more respected and divisive than the chypre. As an olfactive style, the chypre is also incredible versatile with some opting smell musty, sour, faceless and mean whilst others can appear much softer and comforting. In this piece you will find three fragrances that represent the evolution of the chypre from the classic to the modern and to the contemporary. Think of them as the past, present and the future of the genre, mapping the early beginnings of the standard bearer to the revolutionary composition from one of perfumery’s most exciting houses. The standard bearer of the classic chypre accord is Guerlain’s Mitsouko. Coming a mere two years after Coty’s Chypre, Mitsouko Jacques Guerlain’s twist on the genre is widely recognised as an improvement on the Coty and it has stood the test of time to become not only one of the best examples of the genre but also one of the greatest perfumes of all time. Named after the heroin from Claude Farrère’s novel ‘La Bataille’ (The Battle) Mitsouko (roughly translated as ‘Mystery’) takes the classic chypre accord and adds a milky peach note that has a comforting and delicate tone. For the most part however, Mitsouko feels a little standoffish – it’s the stoic face of cold beauty that says look, but don’t touch. Mitsouko is a piece of living history, almost perfectly capturing a beloved style of perfumery that is now long gone. There is also a definite sadness to it that speaks of loves lost and sacrifices made, and whilst it may be divisive (as all chypres are) it serves as proof that this type of perfume, above all others, is the most fantastical and thought provoking. In 2009 Guerlain’s in-house perfumer Thierry Wasser re-visited the world of the chypre to create Idylle (Eau de Parfum), a truly modern interpretation of the chypre signature. 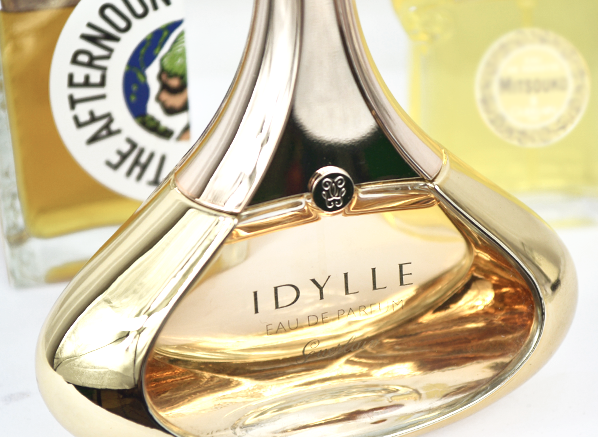 For Idylle, Wasser wanted to capture the essence of a flower garden with wispy notes of rose, jasmine and lily of the valley. This ‘mist of flowers’ is supported by the signature chypre ingredient of patchouli, a note which intensifies the effervescence of the florals. The rest of the base is filled with crystalline musks to give the impression of shimmering golden raindrops. All of the mossy, musty and dirty notes one would usually associate with a chypre are removed to bring the fragrance in line with modern tastes, where sparse cleanliness reigns supreme. The difference in style between the modern and classic chypre is no clearer than in the comparison between Mitsouko and Idylle. In terms of how they actually smell, they are worlds apart but both manage to successfully capture the spirit of the chypre – that strongly defined character paired with a palpable fragility that gives the impression of a soul that is difficult to truly obtain. Once can always trust those renegade perfumers over at Etat Libre d’Orange to create something a little bit different. They are, lest we not forget, the mad scientists who bottled the smell of – cough – ‘bodily fluids’ in Secretions Magnifiques, a perfume that can only be described as an ‘olfactory tour de force’. But when given a classic genre of perfume that needs to be treated carefully, the inhabitants of the Orange Free State can be remarkably respectful. Their foray in to the world of the chypre is seen in 2012’s The Afternoon of a Faun – a perfume inspired by the Nijinsky ballet of the same name. With their offering, Etat Libre d’Orange evoke the spirit of a dense Russian forest where the air is thick and warm with the musty smell of moss and roses. To add an entirely contemporary twist perfumer Ralf Schweiger (also responsible for the brand’s phenomenal Fils de Dieu du Riz et des Agrumes) adds a hefty dose of immortelle – an ingredient that smells like maple syrup, burned sugar and curry spice all at once. The addition of this everlasting flower places the warm animalic hide of a faun right in the centre of the forest, dancing gracefully in the most natural of habitats. It wouldn’t be too rash to call The Afternoon of a Faun one of the truly great chypres and it most certainly is one of the most interesting perfumes to have been launched in the last year or so. If you’re going to try any chypre from the list, or any offering from Etat Libre d’Orange for that matter, you’d be an absolute fool to miss out on this one. I first wore this when I was 18 and since then have had other favourite fragrances. However after a while I return to Mitsouku because it is the only one that has stood the test of time - it's still as fresh to me as the first time I wore it. Others find it mysterious because they can't pin it down, it's not a fragrance that is familiar, brash or everywhere. It's grown up and elegant - what ever your age. The page description of this fragrance is very accurate right down to the spicey note! This entry was posted on Wednesday, October 9th, 2013 at 9:00 am and is filed under Candy Perfume Boy, Fragrance, Guest bloggers. You can follow any responses to this entry through the RSS 2.0 feed. You can skip to the end and leave a response. Pinging is currently not allowed. Chanel Pour Monsieur. A timeless classic that somehow feels incredibly modern. Great choice bzyryanov! A lot of the Chanels have that timeless feel, I think. Leather chypres are wonderful and none better than Estee Lauder’s still radiant Azuree. Fruit chypres are scarcer (scared off perhaps by the greatness of Mitsouko) but the now sadly discontinued (but widely available) Balmain de Balmain is a wonder blackcurrant curiosity. With the addition of aldehydes a wonder such as the rejuvenated Ma Griffe can appear, whilst for pure herbaceousness Aromatics Elixir cannot be beaten. I could (really) go on and on, but I will stop at the gentlest, more transparently beautiful floral chypre, the original Diorella. As ever, you are filled with wonderful knowledge! Thank you for sharing your favourite chypres, there’s some on the list that I must try! I was going to say Grey Flannel despite it being a Fougère. Is it almost a chypre as well? Which leads me to Moss Breches. Yum. Grey Flannel does have a slightly fougere-esque edge, I agree. I’ve not tried the Moss Breches, is it discontinued now? MB continues on ebay! You mean chypre-esque edge or fougère-esque edge?